It is one of the world’s deadliest predators and is easily capable of swallowing a small child. But this little girl isn’t at all afraid of the 15ft Burmese python wrapping its coils around her. 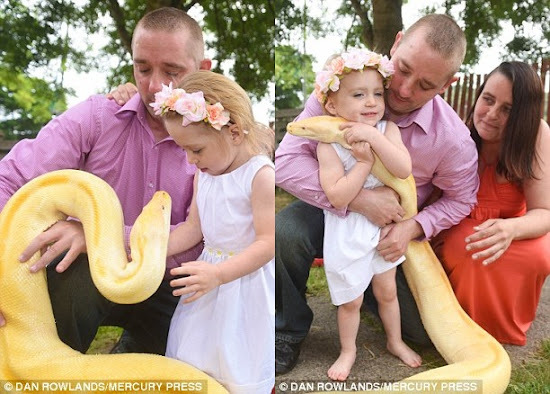 Two-year-old Alisha-Mae loves to have a cuddle with the snake – and her parents are more than happy for her to do so. Burmese pythons, which squeeze their victims to death before eating them whole, have been pictured in the wild swallowing pigs, deer and even alligators. But for Rob Cowan and his fiancée Stacey, such a creature is just part of the family. 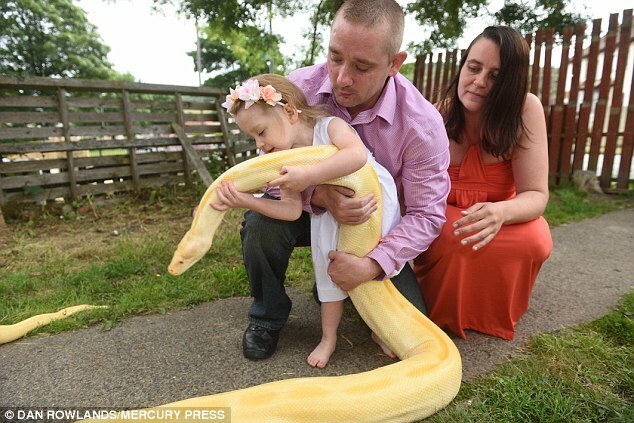 In fact, the couple, from Bradford, West Yorkshire, have 19 snakes, of which this enormous python, called Austin, is the biggest. Mr Cowan, 35, said the eight-year-old reptile – who at 13 stone weighs more than he does – is a ‘gentle giant’ who loves lounging around in the back garden. ‘People can’t believe how friendly and docile he is,’ he added. While most of the family’s snakes eat mice or rats, Austin and a 14ft female anaconda need a little more to fill them up and are fed rabbits and guinea pigs. Mr Cowan insisted that snakes make good pets, saying: ‘It’s careless owners that give them a bad reputation.